Often times when a player owns some ridiculous, outlandish basketball statistic, there is a logical explanation that negates any conspiracy theories of superhumanness or divine intervention. Wilt Chamberlain, for example, scored 100 points in a single game and grabbed a disgusting amount of rebounds; but, he was also an anachronistic beast who was athletically far beyond his years. The guy could not be stopped. And then there’s Pete Maravich. “Pistol” Pete Maravich is the NCAA Division I all-time leading scorer, totaling 3,667 points with an average of 44.2 points per game in three seasons at LSU. That’s right, I said three seasons – he was ineligible to play varsity ball his freshman year. What’s more, is Pete played before the inception of the three-point line, so he was getting chump change for hitting the long ball. Maravich didn’t overpower his opponents like Chamberlain did; he razzle-dazzled, dizzied his foes with crazy handles and trick shots, drilled jumpers from downtown Baton Rouge and “broke ankles” decades before that was even a term. In fact, Maravich is best known for his ball-handling wizardry and majestic passing, skills honed during his early years. As a youngster, Pistol Pete developed his handles by dribbling outside the windows of moving cars and even slept with his basketball when it was time to turn in. 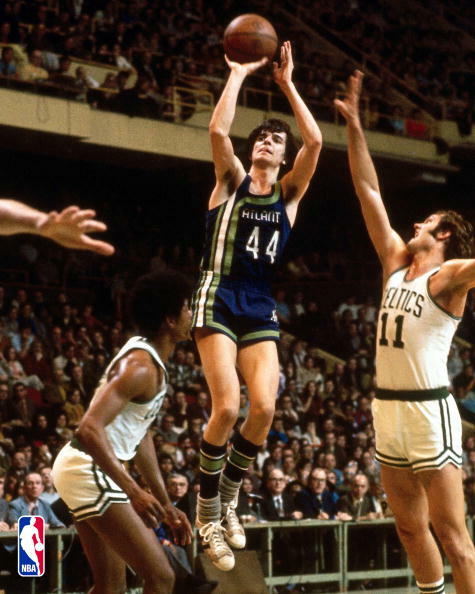 After tearing through the college ranks, Maravich went on to enjoy a successful NBA career. He only played for 12 seasons – the last two riddled with injuries – but averaged a savory 24 PPG and showcased the same pizzazz from his college days. Sadly, Maravich’s life mirrored his magical playing style on the court, speeding by and vanishing right before our eyes. He passed away at 40 years-old of heart complications on the very ground that consumed most of his life: the hardwood. However, the one consolation is Pete left behind plenty of classic footage for us to marvel at. Check out the video below and witness the Pistol, unholstered and entertaining as ever. Does Pistol Pete have the sickest handles of all-time? Drop me a line @MarkAGavigan.